Reduced rate given if you stay two nights and a further reduction if you stay three nights or more. Einion House offers bed and breakfast near Barmouth and Dolgellau with the warmest of welcomes to guests. Our Visit Wales 4 star 18th Century house, offers hotel style accommodation with the personal and homely experience of a Bed and Breakfast. Our B & B lies in Fairbourne on the edge of Snowdonia National Park close to Dolgellau and Tywyn and across the Mawddach, opposite Barmouth, 5 minutes walk to a beautiful Marine Conservation recommended beach, overlooking Cardigan Bay. Einion House has spectacular views across Cardigan Bay to the Rhinogs, and the Llyn peninsula. We offer excellent value and very good quality bed and breakfast accommodation and the friendliest hospitality which will make your stay in Wales unforgettable. All rooms are ensuite and most rooms have a sea view. We are opposite Barmouth, and also close to Dolgellau, Tywyn and Aberdovey as well as other major attractions of Snowdonia. We are ideally located for walking, sightseeing, bird watching, pony trekking, cycling, steam trains and fishing. We are also within easy reach of the local train service 'The Cambrian Coastline' to Barmouth and the No 28 bus service which runs from Dolgellau to Aberystwyth. We are close to The Blue Pool featured in BBC's Secret Britain and the Mawddach Trail featured in Julia Bradbury’s Railway Walks. Off road parking available on the verge opposite Einion House (this is not a private car park). This bed and breakfast (B&B) accommodation is in an ideal location for exploring Snowdonia and North and Mid Wales. It is close to the seaside resort of Barmouth on Cardigan Bay, and the local market town of Dolgellau. Take a relaxing holiday or short break in this beautiful part of Wales exploring and discovering the many attractions in the area, walking by the sea or in the mountains, or enjoy one of the other activities that are on offer. 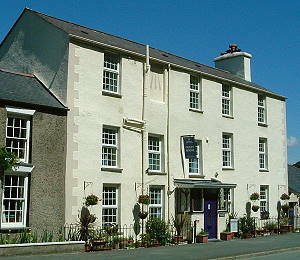 See our location page for more information on the area around this bed & breakfast in Snowdonia. We look forward to welcoming you to Einion House! Content is copyright Einion House Guest House, Bed & Breakfast nr Barmouth, Gwynedd, Snowdonia, Wales.